Google's new phone is banking heavily on its camera's wide breadth of options. Google's Pixel 3 and Pixel 3 XL phones are relying heavily on the appeal of the devices' camera to move units, and as such the camera features were a major focus during Tuesday's Made by Google livestream event. The Pixel phones' cameras will be powered by Google's new Pixel Visual Core chip, which will help make AI features like shooting mode Top Shot and Photo Booth come to life. Top Shot is similar to the iPhone's HDR feature, where it uses Google's image and object recognition and computer vision to pick out the best shots in an entire batch taken in a row. You can select the best shot out of a selection of photos from before and after you press the shutter button. You can slide through an album of alternate images to manually pick the picture you want as well, but the software is meant to do this for you and make things simpler. The new Photo Booth mode will take pictures of you and your friends with the front-facing camera, but only when it actually recognizes that the lot of its subjects are smiling or making funny faces, meaning you don't have to have your finger on the shutter button to take pictures and the phone will handle all this on its own. 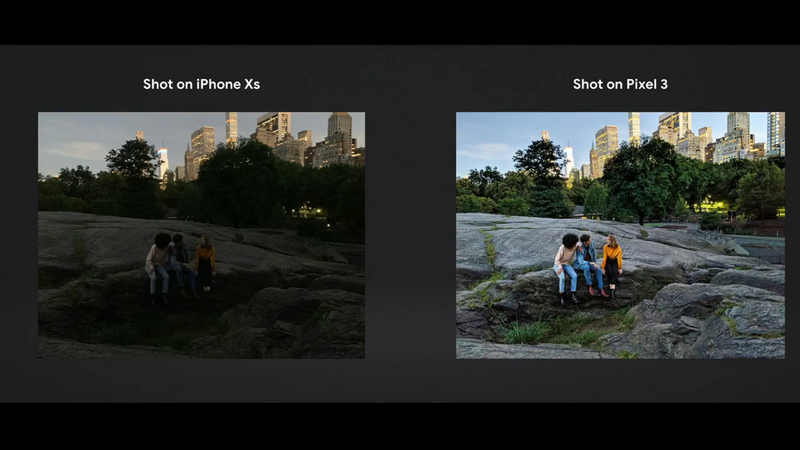 Finally, Google's new Super Res Zoom feature uses a burst of photos to keep the resolution high when you zoom in, and Night Sight will help you to artificially brighten those dark photos you thought were lost. There's also the new Group Selfie Cam for Pixel 3 XL adopters, which lets selfie-takers have access to a wide-angle lens. These camera features are impressive, despite a couple of them being shared with the iPhone, but it's clear Google is working this particular angle hard when it comes to promoting its new twin phone line.